As the sun began to set on the Lithuanian countryside, the final touches were placed on the camouflage netting designed to conceal the position of the Tactical Action Center, or TAC, of the 1st Armored Brigade Combat Team, 34th Infantry Division. As part of the multinational exercise Saber Strike 17, the 1st Armored Brigade Combat Team, 34th Infantry Division, provided support to the Air Assault Task Force commander, Col. Charles Kemper. As the first-ever combined air and ground assault in the annual Saber Strike exercise, this particular training has set a milestone in testing the compatibility of the seven nations and various military branches involved. “We want to reassure all of our NATO Allies that we are in this together,” said Kemper. Kemper also stated that the U.S. presence in the European theater is a measure of deterrence, in addition to assurance. The goal of the U.S. military’s continued involvement in the alliance is to deter any power that poses a threat to NATO allies, and demonstrates the U.S.’s capability to stand ready with its partners. “This exercise is designed to build and increase the interoperability of all NATO-contributing countries, allowing us to boost our capability to react quickly to any world threat that occurs,” said Capt. Josip Jurjevich, a Croatian air force helicopter pilot attached to the 1st Armored Brigade Combat Team, 34th Infantry Division, aviation element. 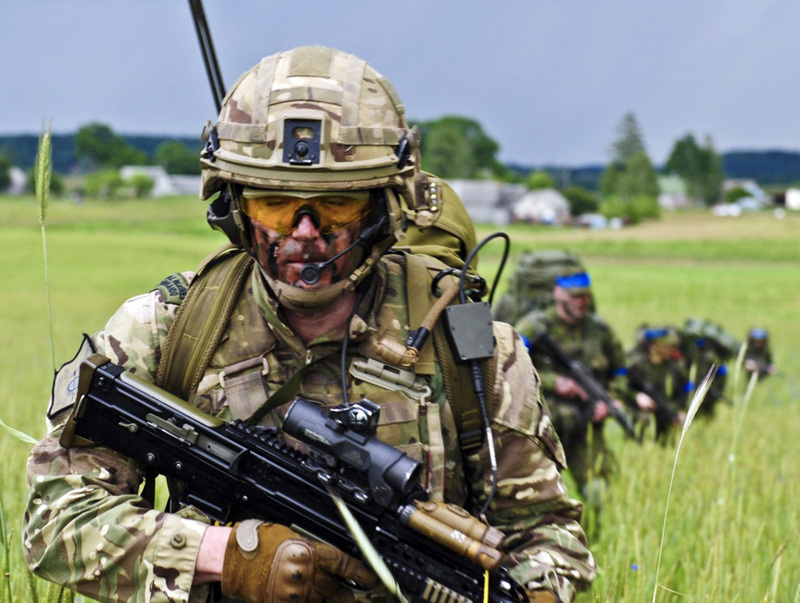 Throughout the planning process, American soldiers, sailors and airmen worked side-by-side with service members from the United Kingdom, Poland, Croatia, Lithuania and Portugal, testing their ability to work together as one cohesive international unit by forming a NATO-enhanced Forward Presence, or eFP, Battle Group. Jurjevich noted that one challenge of the exercise was the necessity to overcome cultural barriers that affect the way each participating country’s military operates. In one example of successful cooperation between partner countries, the U.S. aviation planner implemented input from the two Croatian pilots attached to the TAC to plan helicopter air corridors from the pickup zone to the landing zone. “Even if something is better than our process, that is great, we’ve learned something, or if it’s not, then we can bring something forward for them to learn,” said Jurjevich. With all seven nations converging at the Kazlu Ruda airstrip, the newly-formed Task Force Red Bull conducted an air mission brief and a combined arms rehearsal. Tight living quarters shorten the period of time it takes to become comfortable with one another, said 1st Lt. Josip Perich, another Croatian air force helicopter pilot attached to the 1st Armored Brigade Combat Team, 34th Infantry Division. “With 18 of us crammed into only two trucks working together on the mission, we are able to develop trust and confidence in one another very quickly,” he said. A pre-established relationship between nations through exercises like Saber Strike is meant to lay footwork for a long-lasting rapport with all U.S. NATO allies. “We were like a family in two small trucks, working together, sweating together for the same collective mission,” said Perich.